I'm really looking forward to finally after all these years seeing a update to this twin build. Seeing as these two birds jumped onto the proverbial shelf of doom, the parts were all jumbled together. I just spent an hour sorting the parts for the D from the parts for the Q (having two Big Ed sets, plus two different sets of resin parts - including the ones from SH themselves) certainly didn't make my life any easier. Long story short, the parts are all sorted now and as soon as I finish a build for M.I.M. magazine I'll be back on track with these two. This project might just back on.... Just because it's so different than the other things I have been working on. I've noticed the gunbay fits much better than I originally thought. According to Glen Coles, Kitty Hawk are aiming for VJ Day 2015 for the Airacobra. Awesome thank you! I don't want to miss out. I always say that, but some how never do. It depends on when the kit is released. I'll be building a Tamiya or Hasegawa kit after the Mosquito. Something simple and OOB. It's been a long time between build posts. I gather that after you finish the Mosquito, and then the Typhoon, you'll be tackling the Kitty Hawk P-39? I'm glad I had to break from this project to work on my 1/24th scale Mosquito because this project is now moot. Which is well and good because the CMK gunbay just wasn't fitting. Either it was as low as it could go and the walls of the wheel well sat correctly, which dropped the floor of the gunbay above too low, or the floor sat lever and there was a gap between the wheel well opening and the wheel well casting. Well folks - as these things go, time got away from me this past week, but the whole purpose behind this build thread was to keep myself building so here's a brief update. I have spent all the time since my last update prepping the parts to be painted Bell aircraft green - I love and hate this part of any build. I love it because you get to put down colour very soon, but it can take forever to get all the parts cleaned up and prepped. I'm most of the way through. 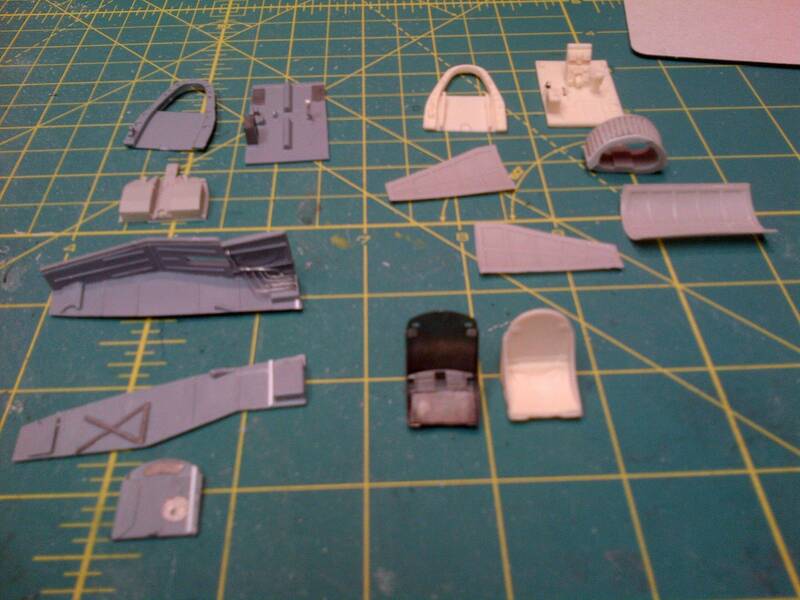 I have decided to use the Special Hobby resin for the interior as provided in the Q kit over most of the Eduard pieces. I prefer the depth provided by resin parts and they respond well to my weathering techniques. As always I compare the photoetch replacement parts to the resin - every now and then I'll carve some resin off to use a more delicate P/E piece. I'll be using the resin seat and an Eduard seat for these builds - the resin seat has a nice moulded cushion and has all the same detail as the p/e replacement. I have to finish up collecting the interior pieces - it's taking longer than normal, probably because some idiot decided I should build two limited run kits at once. Then I'll start the interior painting and weathering process. I'm also trouble shooting some fit issues with the CMK gunbay - but on the bright side I have a plan of attack for lengthening the fuse! Sorry for the blurry photo - I took it on my Blackberry for the sake of having something to include with this post. ...I swear to god there's a lot more work there than it looks like. Note that I replaced the P/E harness in the nosebay with wiring. I used the P/E piece as a template. Scrodes let's disregard the rivet counting. I'm keen to see your work! Oh don't you worry - I haven't forgotten you fine folks, it's just been a busy week. I'm still making progress and I hope to get some building done today worth updating! Remember, modelling is supposed to produce enjoyment, not tension. THe drawing says "as actually taped", and if you read the thread you would know the measurements came from an actual aircraft. Hey Matt, this is quite the Thread/Tutorial/Discussion Forum you've got going here. Had to comment, awesome Build idea and, having viewed your Builds "in the flesh" so to speak I predict another pair of absolutely top notch Models. We are talking about the GWH kit, right? Gaston for once did the right thing and went to source, getting measurements direct from the people restoring a Black Widow. GWH retooled the canopy to overcome some of the most obvious problems with the first release, but even the second attempt (while a big improvement) isn't quite right. Anyway, let's not risk hijacking the Airacobra thread by raking over old ground. Well actually he wasn't. He was going off a CAD picture and the actual kit was different and accurate if I recall correctly. Actually - giving credit where it's due - while I often don't agree with him, Gaston was quite right on that one. My biggest problem is that I typically forget to message Mal until I'm three days away from painting the markings or he's busing building a new cave. The nerve of the guy.